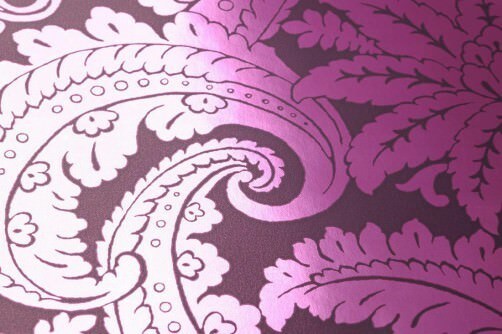 Purple Wallpaper – Pure Delight | Discover our Purple Wallpaper Range! Purple – a colour brimming with sophistication and luxury, a colour that exudes magic and enchantment, with a smidgeon of decadence and hedonism thrown in for good measure. Not for timid spirits, in other words. When it comes to interior design, purple wall-coverings require some skill and intuition, as their effect can be very emotional and mysterious, especially when combined with patterns and structures. As a result, wall décor in purple is the perfect style element if your goal is to create a magical world of wonder in your home. 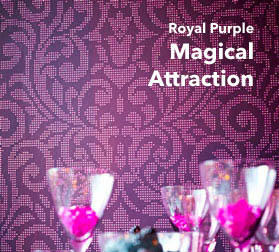 Magnetic and mesmerising, versatile and gorgeous – our purple wallpaper range will bewitch and enthral you. As every child will be able to tell you, purple is a combination of blue and red – but the possibilities in terms of shades and hues are endless: violet and lilac lend cool elegance to a room and create a romantic ambience, whilst the darker tones exude an almost magical power of attraction. Purple is perfectly suited to be combined with gold and silver, and patterns designed in this manner fill a room with enchantment and grandeur. Floral wall-coverings in purple and white provide a regal atmosphere, complementing a more traditional interior design style, and modern purist or minimal surroundings benefit from the extravagant touch of purple wallpapers. The colour purple is often associated with spirituality, as it represents different levels of existence: the here and now as well as a threshold to another hidden world. This juxtaposition is also reflected in purple wallpapers, as it has a unique effect on both room and beholder. Purple is said to enhance decisiveness and restore the emotional equilibrium. Purple wall décor comes in many forms: effect wallpapers, patterned wallpapers, geometric or graphic wallpaper, or baroque and floral motifs – they all provide a little bit of magic and mystery when it comes to designing your environment. But there is no mystery in where you can find them: right here! 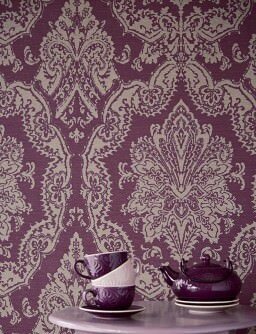 Purple wallpapers in a myriad of pattern and structure variations are available in our Wallpaper Shop. They all have one thing in common: they are magical eye-catchers and come in all sorts of hues, e.g. lilac and violet. Wallpapers in purple exude an air of sophistication, intrigue, elegance and playfulness. They can be beautifully combined with a large number of other colours, and they provide the perfect patterns, surface materials and structures for individual interior design concepts. Immerse yourself in this purple wonderland of Design Wallpapers which will seduce your senses. Purple is one of the crimson colours which include all hues between blue and red. Purple is named after the Purple Dye Murex and known as a “royal colour”. The colour violet is named after the flower (French: violette). The colour scale contains a number of different purple hues, e.g. lilac, violet, and related colours like magenta, pink and indigo, which can also be part of colour combinations that create purple hues. Purple mixed with white is called lilac. Lilac and purple are often used synonymously in common parlance. 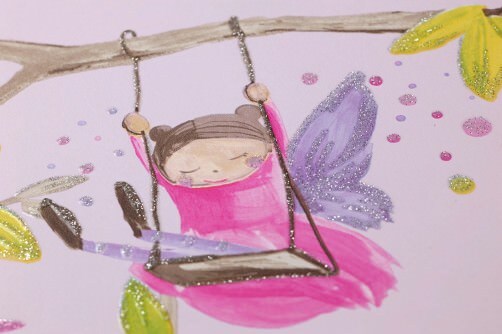 Especially children often mix up purple and violet. But violet tends to lean more towards red or blue. Lightening purple with white creates a variety of hues, mixing it with black intensifies the tone. The lighter the tone, the more differentiated its psycho-energetic effect. Colour symbolic and the effects on humans and rooms prove that purple wallpapers are a very exciting concept. The colour purple stands for harmonising opposites, for ambiguity, magic and mystique, sensitivity, emotion and decadence. Opposites and ambiguity create tension, and with it the mysterious air the colour purple provides. Purple attracts the gaze, it builds bridges between the familiar and the unknown, it can encourage decisiveness and balance emotions. Spirituality, transcendentalism, the intangible, the fantastical is often linked to purple. Purple is also the colour of feminism. Purple dungarees were the go-to garment for the women's movement in the 1970s. This cult garment combined the male blue with the female pink to create purple. But even decades before, purple was seen as the colour of women's demarcation from male dominance, a symbol of women's independence and self-rule. The effect of the colour purple on a room is extravagant, intensive, inspiring, creative, artistic, elegant and unusual. The fact that the colour purple is rare in nature makes it exotic and lends it a strong, sometimes dramatic air. Light purple or lilac is cool and calming and doesn't domineer a room. Wallpapers in purple open up new magical worlds, they support intuition and help with concentration, finding new ideas, and, as a result, they strengthen self-confidence. And there is always a flash of the mysterious, of the magical. Violet wallpaper has a calming and relaxing effect on the psyche. It is also supposed to curb the appetite. Purple design wallpapers open new horizons in terms of interior design, because patterns, colour combinations, delicate surface materials, structures, embossing techniques, and special effects provide a platform for thousands of irresistible wall décor creations. 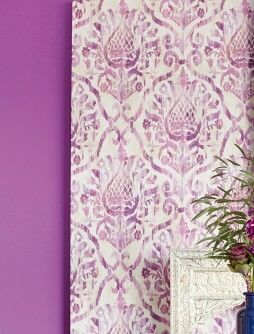 Purple is open for all other colours and thus allows for a myriad of combinations in terms of base and pattern colours, as seen in our wall décors in purple. On a purple or lilac background, bright colours like orange, yellow, red, turquoise, and various hues of green really come into their own. Metallic colours like gold, silver, copper or bronze give a truly modern character to the base colour purple. Amongst the most popular base colours that lend themselves to be married beautifully to purple patterns are warm beige, golden beige and white. Black lends an extravagant and mysterious air to purple patterns and motifs. Clever integration of pattern elements in purple, lilac, magenta or pink creates a strong effect and emphasises structures and visual highlights, for instance in our wallpaper model violet Malika. 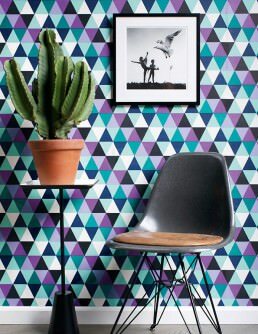 Playful, experimental, daring and creative - all this and more is reflected in the purple wallpapers of our range. Each pattern creation creates an individual expression and emphasises and supports any given interior design style. Opulent baroque patterns, art nouveau patterns, imaginative floral patterns, abstract and geometric patterns, cult retro patterns based on the 1970s, fairy tale elements - the choice is yours! 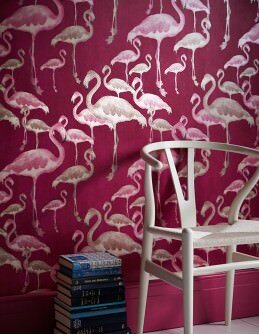 Why not explore how wallpapers in purple hues from our Wallpaper Shop can create magic moments in a room. Design wallpapers in Violet impress with their patterns and unique colour combinations as well as their structures and effects and exquisite surface materials. Both recycled paper or fleece/non-woven structures can be carrier materials for purple wallpapers. Further to the carrier material, wallpapers can also be categorised by specific surface materials like effect foils, metal foils, natural materials, textiles, glass beads or imitation leather. 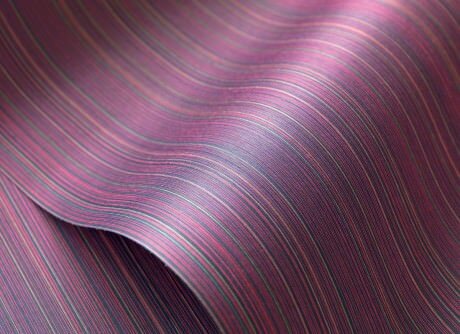 Amongst the purple textile wallpapers in our extensive range are flock and crush wallpapers with uniquely haptic structures. Metal wallpapers violet are treated with a paper-thin metal foil, and often undergo effect techniques or structure-creating processes like embossing, oxidation or etching. 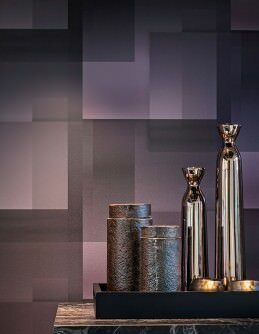 The metal sheen constantly changes as light hits the wallpaper, creating a myriad of pattern variations. Purple effect foil wallpapers enjoy the same mysterious reputation, because they allow the senses to immerse themselves in optical illusions, e.g. via hologram, rainbow and 3D effects. Glass bead wallpapers in purple create stunning glitter effects on the wall. 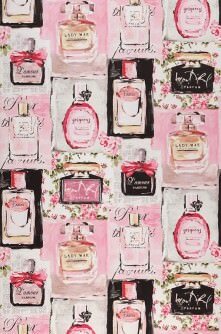 Countless tiny magical pearls form a pattern or motif or create an all-over sparkly wallpaper surface. Textile wallpapers and Nature Wallpapers in Purple don't just look exceptionally good, they can also be tantalising to the senses. The materials possess intrinsic qualities that speak for themselves. 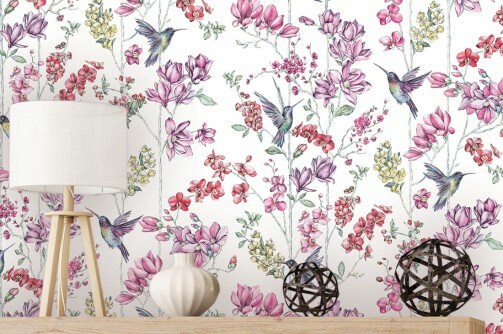 This is why these high-quality design wallpapers are also available in purple alone, with no other colours or patterns involved. The structure forms its own pattern, or it can be created through special manufacturing processes. Delicate stripes, which assume a certain plasticity, are created by textile wallpapers with a crush appearance. 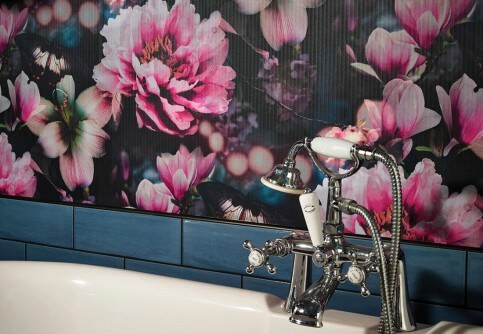 For flock wallpapers in violet, the patterns are three-dimensional and tactile. The sophistication and edge of leather imitation wallpapers in purple is achieved via extremely realistic material imitations. Our purple leather wallpapers are made from vinyl imitation leather and finished with an incredibly natural looking embossing technique. These purple leather wall treatments create amazingly elegant rooms which exude luxury and exoticism. Feature walls created with purple wallpapers give stunning pattern wallpapers the platform to spread their desired effect. This provides the perfect way to emphasise specific areas in a room. 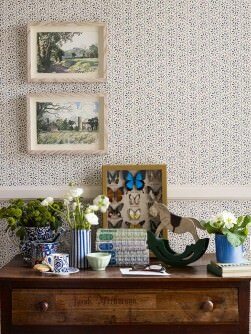 It will, for instance, turn a wall behind a sofa or desk, or perhaps the wall in a dining room most likely to attract the gaze during cosy meals with friends and family, into a true eye-catcher, and create a truly memorable scene. After all, we have just learnt that purple is the colour that unifies opposites and introduces movement into a room. For purists, we have a number of single-colour designer wallpapers in purple tones, which nevertheless provide interest through fantastic material structures. Please bear in mind that rooms can appear smaller if a strong colour dominates. Light or even white floors and ceilings as well as furniture and decorative objects can be used to break up the potential monotony and provide additional interest. Natural light sources like windows or French doors also help to accommodate strong or dark colours. Large mirrors fixed to one wall make a room look much larger, too. Purple wallpapers - suitable for any kind of room? Yes and yes again! Purple wall décor can create a magical atmosphere in any type of room, be it in the bathroom or guest toilet, the living or dining room, the kitchen, study, snug, the stairway, hallway or children's room. The key is the right choice of patterns, pattern/colour combinations, special effects, and the light in a room. Purple feature walls send magical signals and lend a certain je ne sais quoi to the ambience as a whole. 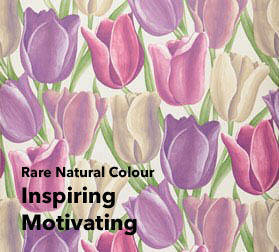 Wallpapers in violet are also suitable for very modern, elegant and sophisticated living styles. A very "now" combination of vintage and modern can easily be achieved by using a gorgeous purple wallpaper, as it makes every detail in a room more noticeable. Pattern wallpapers in purple are also perfect for romantic and nostalgic interior design concepts.